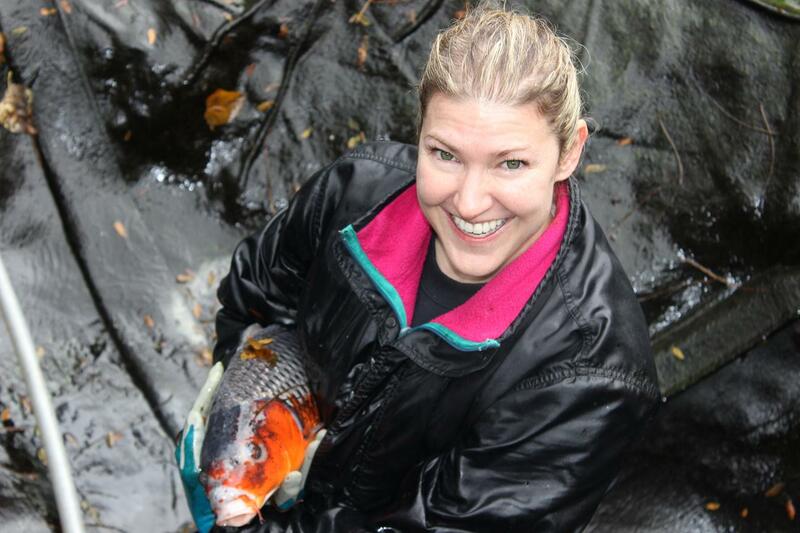 Michelle and her Koi were the popular destination on the 2nd Pond & Garden Tour in Waterloo Region in September. 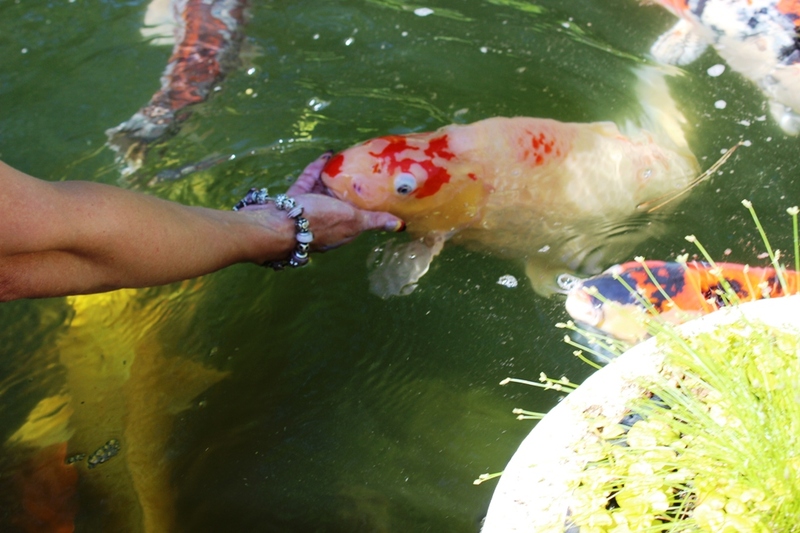 She shares her backyard with 28 stunning Japanese Koi, many almost three feet in size and so gentle and friendly, swimming right over for a loving stroke under their chins. 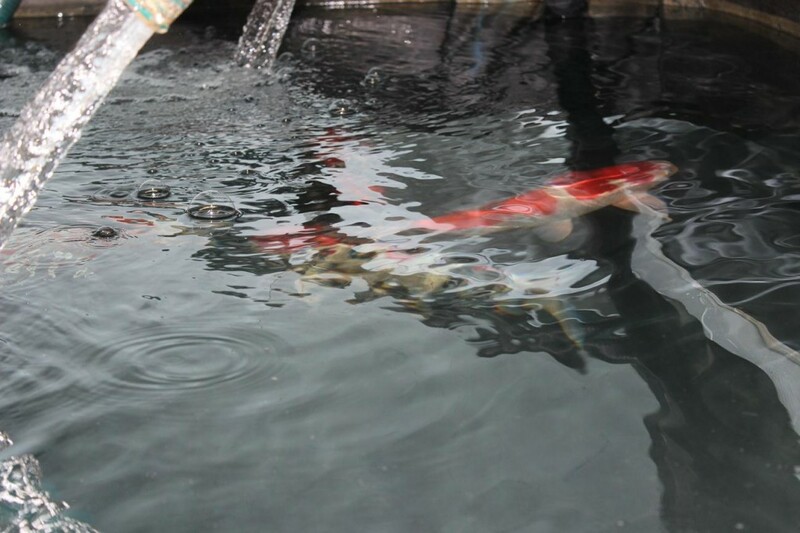 They all have really cool names too, like the two matching butterfly koi, Catherine and Heathcliff. 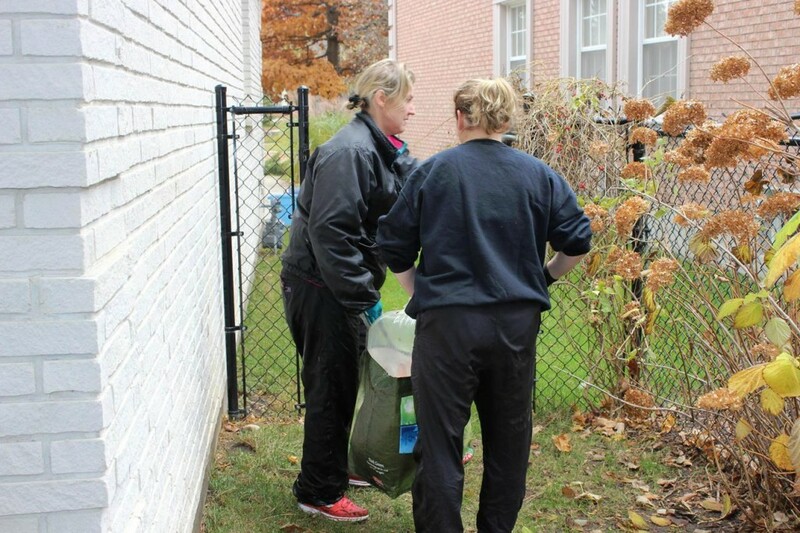 Michelle’s love of ponds began back when she was just a girl. It was kept on hold until she was a grown up living in her own home. 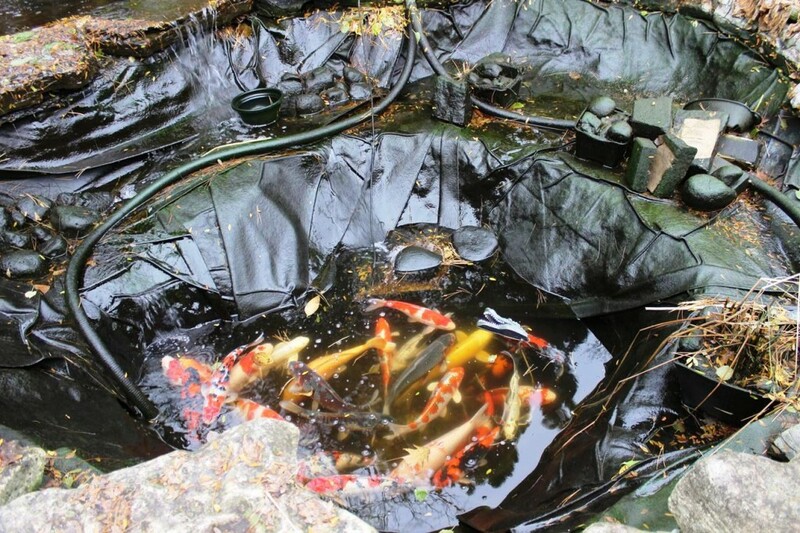 About 10 years ago she finally gave in to her passion by stocking a pond with a few goldfish and garden koi. She immediately felt the addictive nature of this hobby – haven’t we all? Before long she was ordering koi from Japan and explaining the ‘live’ mail order packages to her husband, Joe. 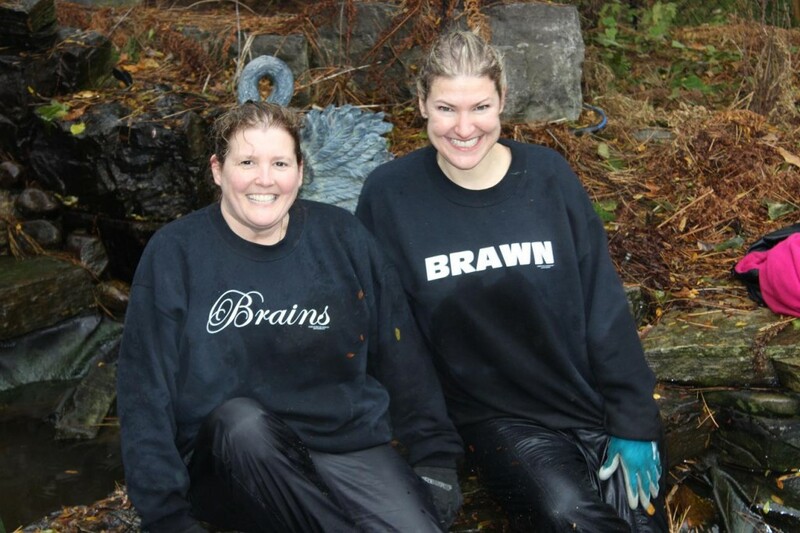 He indulged her hobby and together they dug and built a magnificent pond and waterfall. 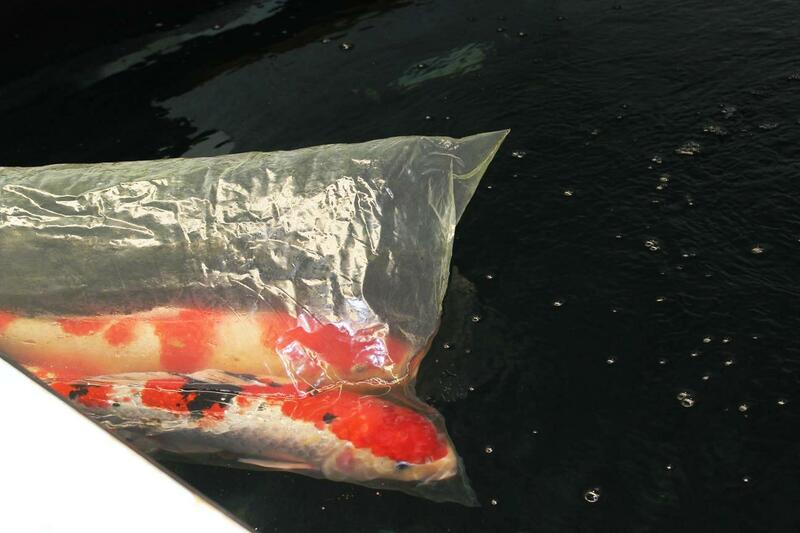 Fast forward seven years; Michelle has a residential collection of Japanese Koi that is the envy of Waterloo Region. Her darlings include Showa, Sanke, Ohan Hiwake, and Kohaku. Of course, any hobbyist knows that pond keeping is fraught with dangers, from herons and racoons or minks feeding on your family members to our harsh Canadian winters followed by ever higher spring kills. Michelle decided to over winter her koi in the basement where they’d be safe and sound and under her watchful eye. 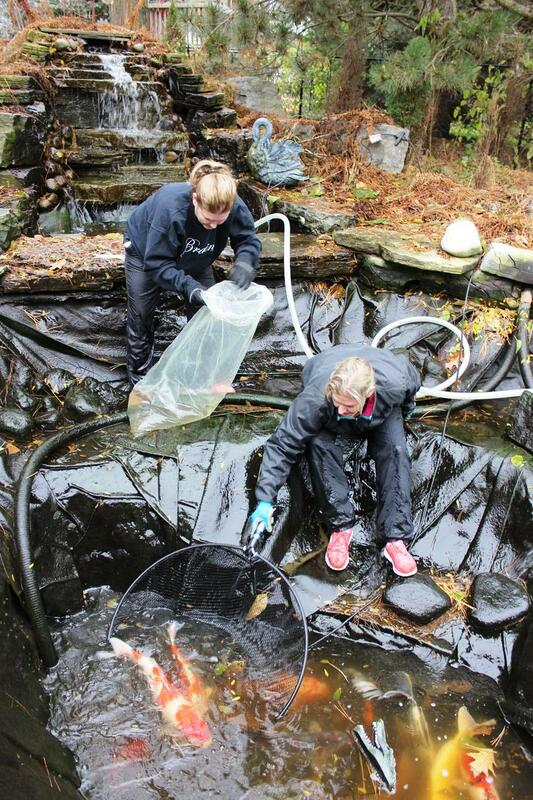 I had the pleasure of joining in the annual fall pond closing when the koi are moved from the pond to the basement. More technical info follows later on, but let’s get right to the journey and how she does it. 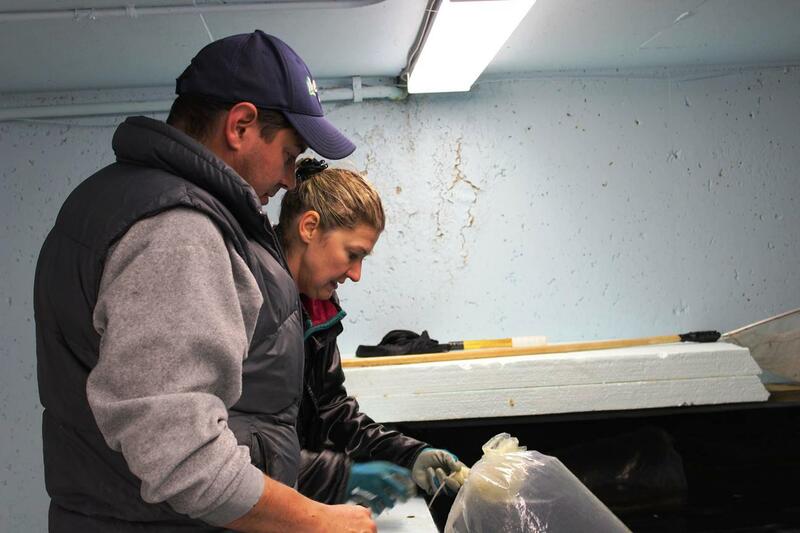 The first thing Michelle had to do was get the indoor water prepped and ready for the fish to move. 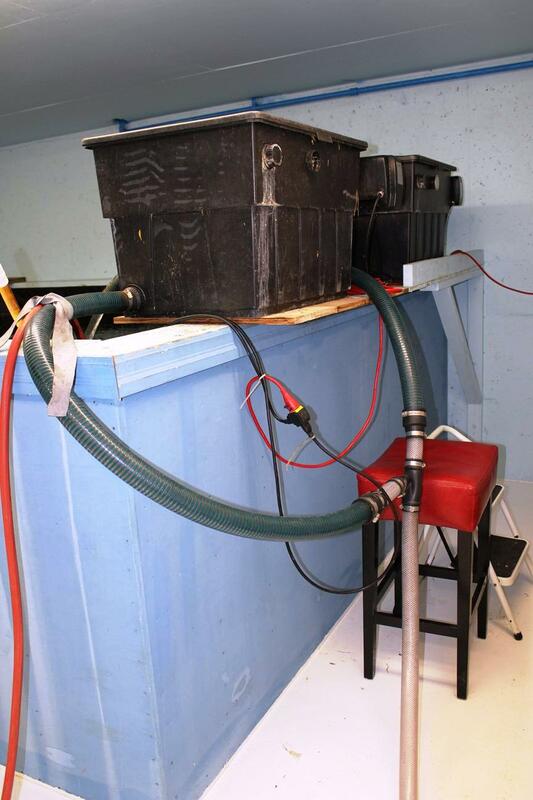 The filtration system with its existing beneficial bacteria is critical for water quality. The set up and take down of the filters takes several hours each time. Catching fish is no easy task at any time of year. 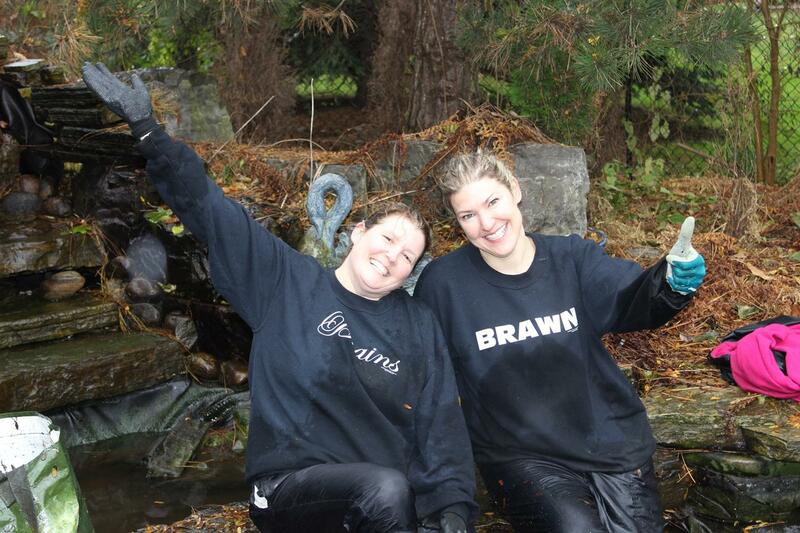 It’s a bi-annual adventure that Michelle shares with her best friend Trish. 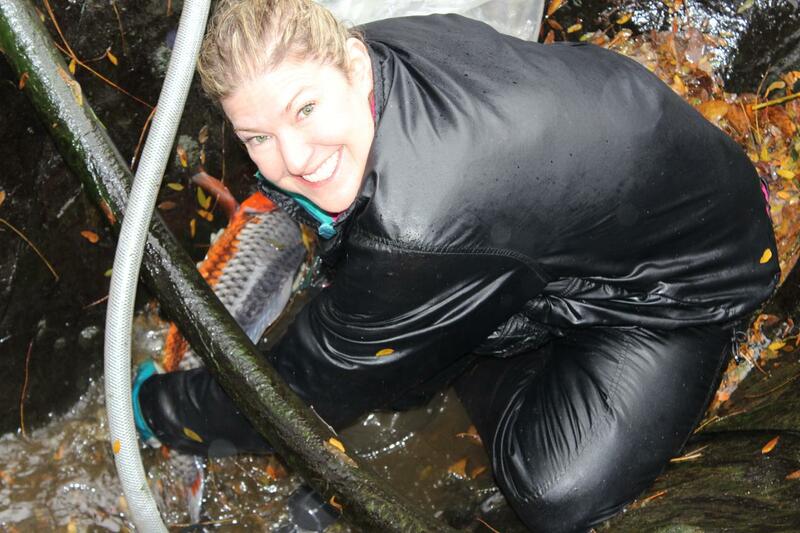 Michelle drastically lowers the pond water so she has easy access to her koi. 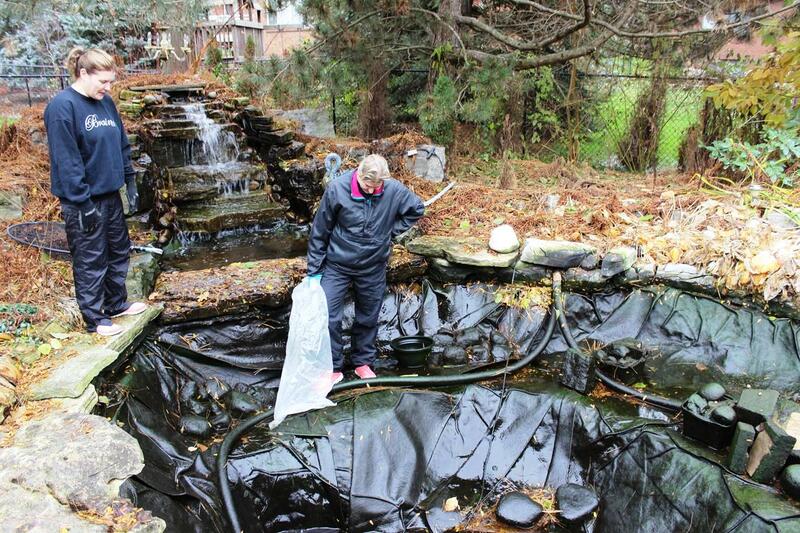 Correction, as the photos show, access isn’t easy at all, as she’s stepping down into a very slippery pond. 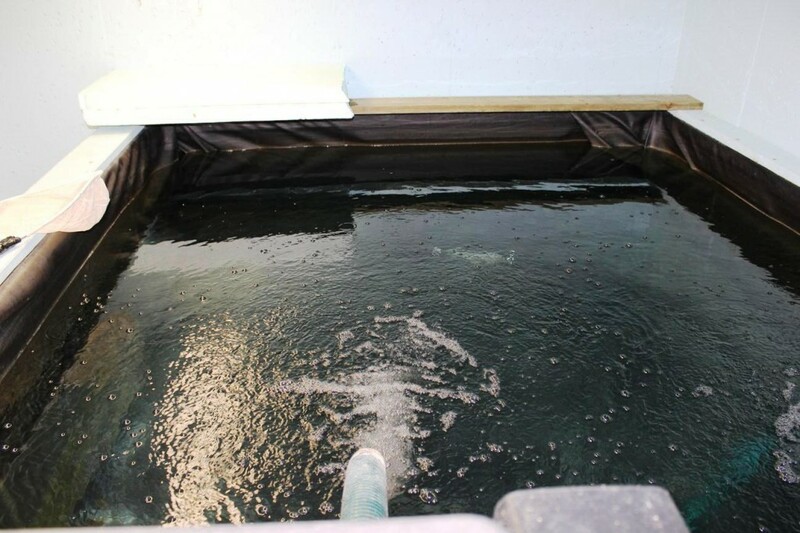 However, the water is quite cold, so the fish are less likely to jump. Still, I was a bundle of nerves watching on the sidelines. 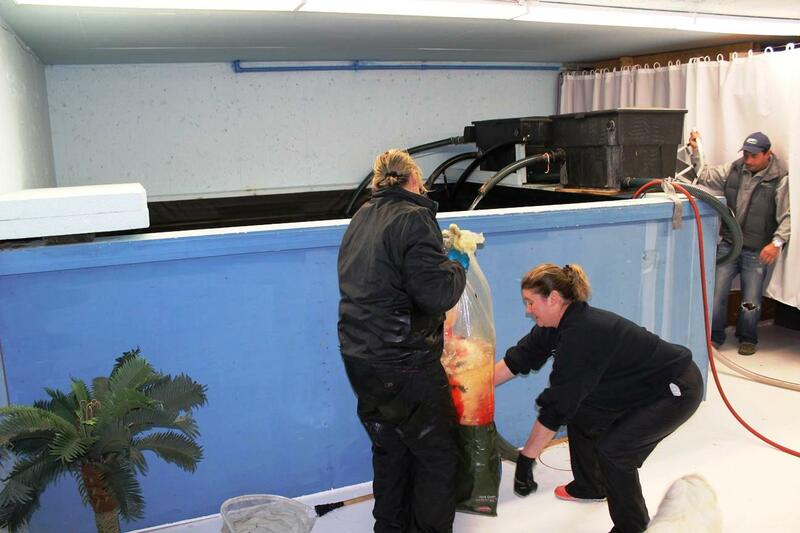 Michelle lets the koi float in the indoor tank while she catches some more fish outside. The water temperature inside is still relatively cool, around 10 degrees versus 6 degrees outside, so there’s no massive shock to their systems. 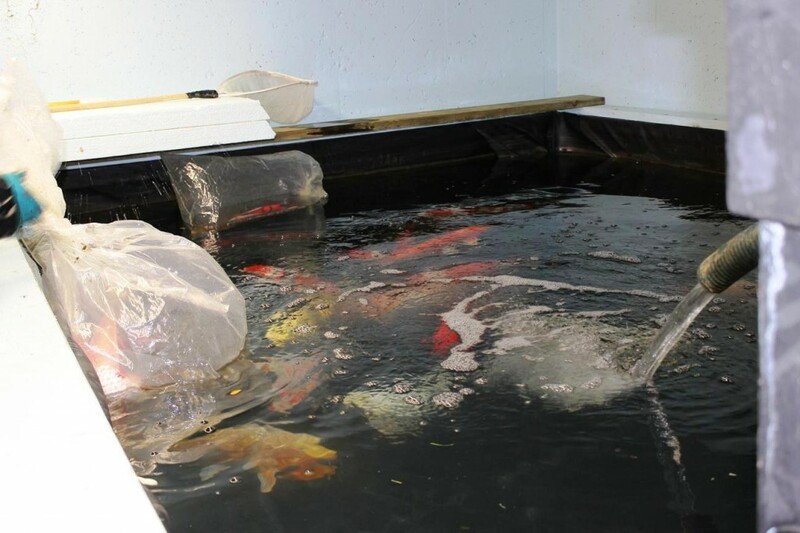 When she brings in the next bag, she sets the first fish free in the tank, and so on. It’s like they know their winter home. At this point Michelle has to lower the pond water quite a bit, as the fish are sinking to the bottom of the seven foot depth. There’s only one small slippery shelf to stand on, so she relents and just gets into the very cold water, feeling around in the murky water with her hands for the koi. 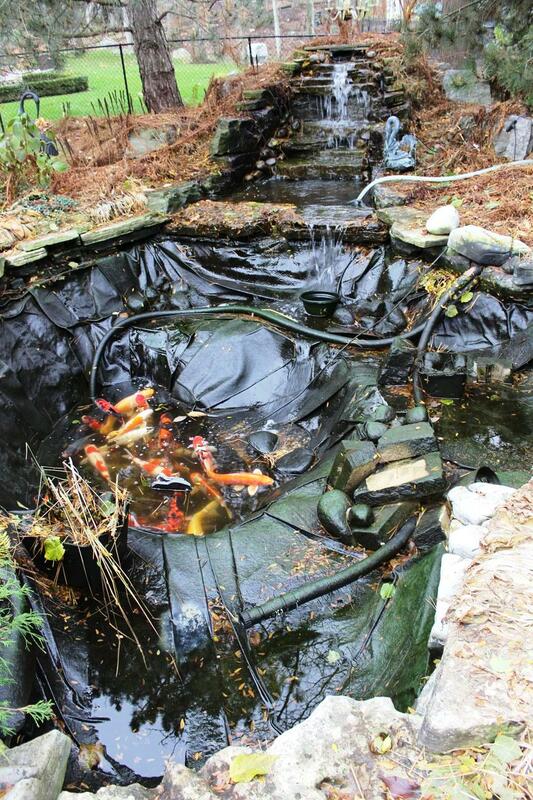 With 28 koi you can imagine the trips back and forth and up and down from the pond to the basement. Michelle’s husband Joe is very helpful, even though this isn’t his hobby (he keeps saying). The weather doesn’t hold, of course. Cold rain mixed with snowflakes will not wait until this job is done. 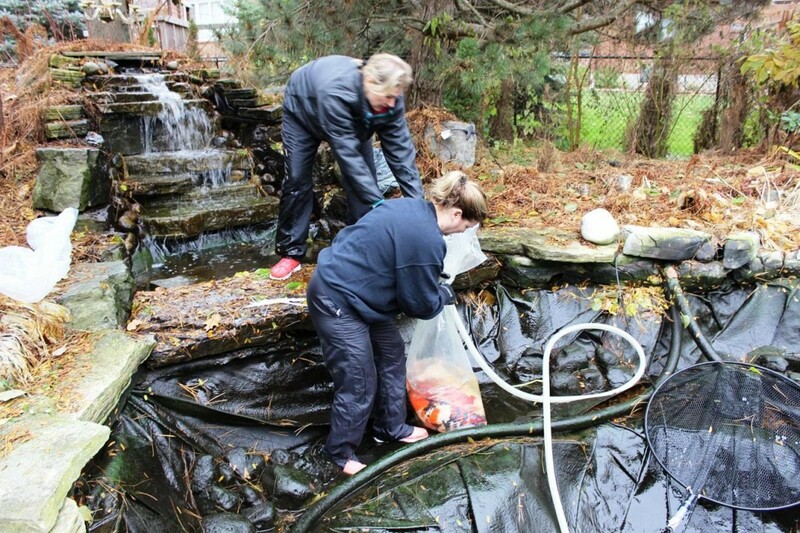 Joe is making sure the fish are accounted for while Michelle goes right into the bottom of the pond to scoop up the last hold outs. Just think. The first or second week in June, this entire process is reversed. Bestie Trish always brings a change of clothes for after her hot shower and they relax knowing they’re good to go for another year. Michelle even had shirts made for them. From start to finish, this amazing project took just two hours. Really. Oh, I forgot to mention that there is a lone goldfish in her collection. Her husband named it ‘Lucky’. 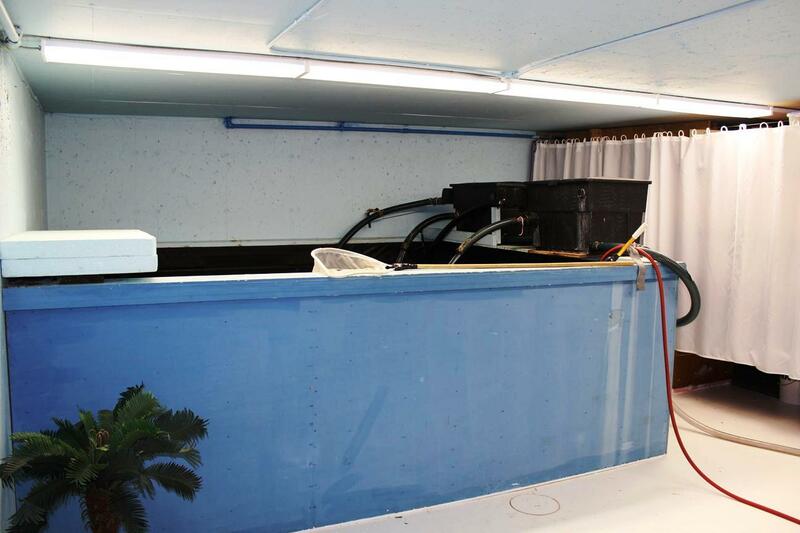 Following is my Q & A with Michelle on how she maintains the indoor tank. Test as required, use salt regularly and 10% water changes each week! Period! Works really well and keeps the fish growing! Next year I will improve the filter hose set up and switch to bango fittings from the worm drive clamps I am currently using. 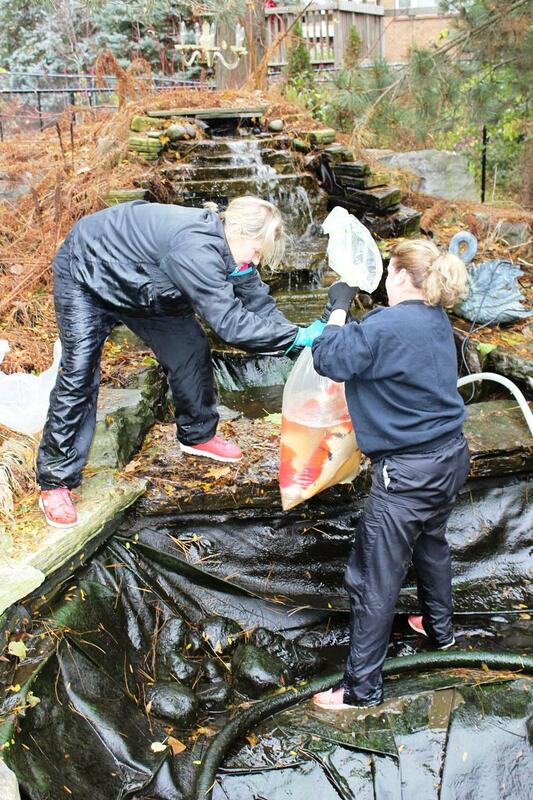 The filters have a back wash system that aids in cleaning and draining the pond. 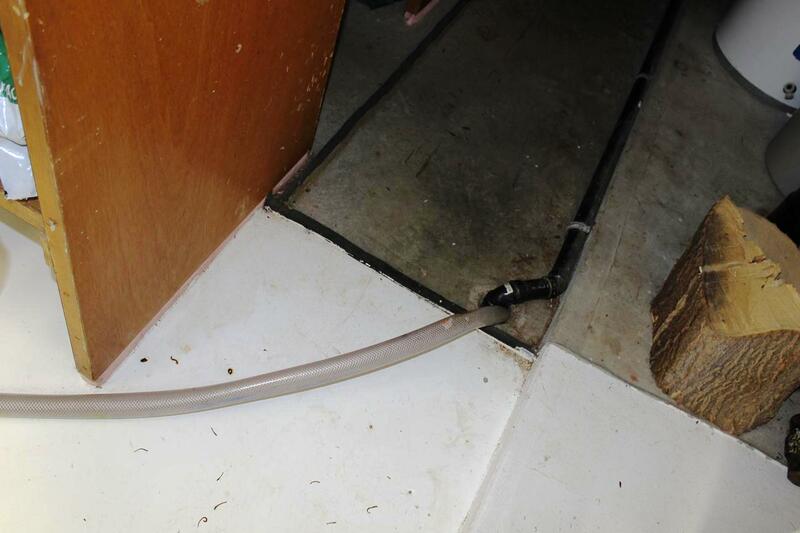 In the indoor pond the back wash valves are connected to 2” lines that are hooked up to a floor drain in the basement. Simple scrunging and back washing, about 5 min work every week. That’s it. 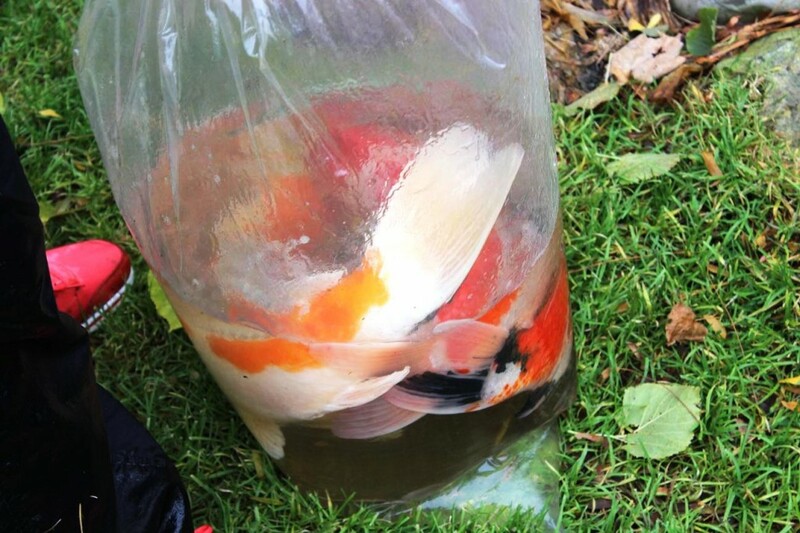 Do you feed the fish over the winter? Yes, the water temperature in the basement is approx. 21 degrees and they get fed every two days. 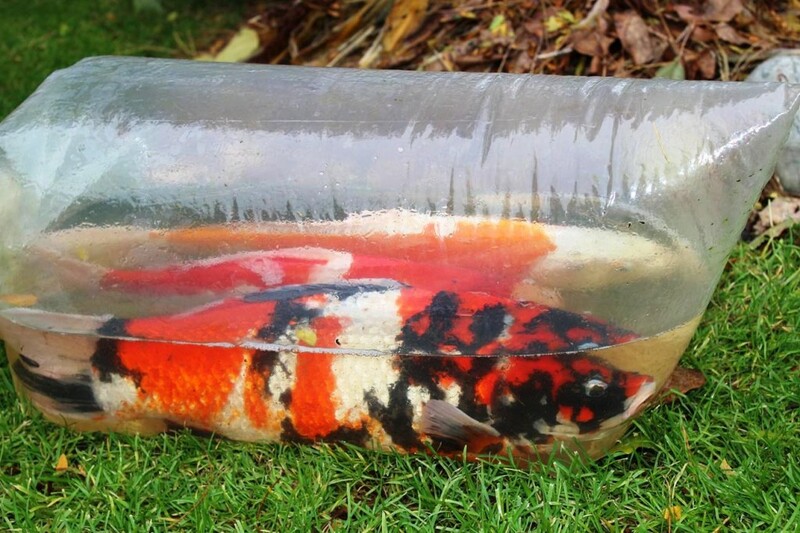 No WONDER her koi are the healthy gorgeous fish that they are in just seven years. Sigh.